Sorry, no matches on eBay for "Die MenschMaschine [The Man Machine] Kraftwerk". 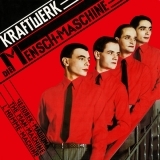 Die Mensch·Maschine [The Man-Machine] is ranked 2nd best out of 18 albums by Kraftwerk on BestEverAlbums.com. The best album by Kraftwerk is Trans-Europa Express which is ranked number 278 in the list of all-time albums with a total rank score of 10,073. Members who like this album also like: The Dark Side Of The Moon by Pink Floyd, Wish You Were Here by Pink Floyd and London Calling by The Clash. Showing latest 5 ratings for this album. | Show all 544 ratings for this album. Their best album. Top notch. This landmark synthpop record from Kraftwerk is absolutely stunning throughout and really did set the precedent for the entirety of 80s electronic pop. The shift in genre from prog electronic to more accessible poppier compositions works incredibly well. From hip-hop to dance to rock, there are many worlds of music that have been directly influenced by "The Man-Machine". It's no coincidence that "The Model" topped the charts in 1981 in the UK, over 3 years after this record was released... the world wasn't quite ready for its futuristic pop sound back in '78. Nothing less than a monumental achievement and one of my very favourite pieces of art. 40 years later, and this still feels so magical and effortless. I love it. My favourite Kraftwerk album. The man machine, features beautiful soundscapes combined with a pop mentality. The model, even became a no:1 hit in the U.K. a few years down the line. Perfect late night chill out music. They were so ahead of their time. It's Trans-Europe-Express, but with a poppier vibe and more dance beats. How can you argue with that? This just blow my mind, still have pieces of my brain in the ground.